Rockstar's Red Dead Redemption 2 is a huge game in every sense of the word, delivering us an expanded map and an even bigger story than before. In this Red Dead Redemption 2 guide, we'll be walking you through all the information that you need to get started with the massive game, so you can set off on adventures around the wild west as easily as possible. But, if you’re instead looking for USgamer’s verdict on the biggest game of 2018, you’ll want to check out our Red Dead Redemption 2 review. Just what did we make of Arthur Morgan's epic open-world adventure? In this detailed Red Dead Redemption 2 guide you'll find all our detailed guides pages on Red Dead Redemption 2. We've divided our RDR2 guides up into different areas of the game, including guides on everything you can find out in the open world of the wild west, all the weapons and customization options for guns, and much more. These RDR2 guides and tips are ideal if you're just starting out with the game and want to get some pointers on how to do some of the game's multitude of tasks. Red Dead Redemption 2 is a complex game so there's a lot to get your head around and plenty of sometimes awkward controls to remember. You start out Red Dead Redemption 2 with barely any weapons or equipment, and the game doesn't explain a whole lot to you in the opening hours. In the guide link below, you can find not only information on how to equip your very first weapon as Arthur Morgan, but also information on how to change your weapon loadout on the fly. How to Get a Gun in Red Dead Redemption 2. Since this is our beginner's guide to Red Dead Redemption 2, what better place to list our intricate systems guides for the game? Check the list of guide links below for how to change the camera of Red Dead Redemption 2, how to shave, get a new horse, and more. How to Play in First Person in Red Dead Redemption 2. How to Shave in Red Dead Redemption 2. How to Get a New Horse in Red Dead Redemption 2. How to Retrieve Your Hat in Red Dead Redemption 2. How to Save in Red Dead Redemption 2 - How Does Autosave Work in RDR2? If you want to check if the game has autosaved, you can view your save files by pausing the game, then going to the Story option, then choosing to load a save. From this screen you can see when your most recent save was made. Arthur Morgan doesn't begin life as the toughest outlaw in Red Dead Redemption 2. If you're looking to upgrade Morgan's health or stamina meters, giving him a vital boost while you're roaming the open world and getting into gunfights, check out the guide links below. How to Increase Your Stamina in Red Dead Redemption 2. How to Increase Your Health in Red Dead Redemption 2. Money makes the world go round in Red Dead Redemption 2, especially if you're part of the Dutch Van der Linde gang. In the guide links below, you can find information on how to make money quickly, how to unlock Fences to sell your stolen goods to, and how to pay off a bounty that's been placed on your head. How to Make Money in Red Dead Redemption 2. How to Unlock Fences in Red Dead Redemption 2. How to Pay off a Bounty in Red Dead Redemption 2. The original Red Dead Redemption featured a morality system called Honor, and it's back again for the prequel. Refer to our guide below if you want information on how to increase and decrease your Honor rank, as well as any rewards you'll obtain in the process. Red Dead Redemption 2 Honor Guide. The law is a force to be reckoned with in Red Dead Redemption 2, and you don't want to fall on the wrong side of it. Check out our guides below on how to understand the Wanted system, as well as how to work with the law and take on bounty missions. Red Dead Redemption 2 Wanted System Explained. Red Dead Redemption 2 Bounties Guide. Hunting is the life and soul of the wild west, although tracking down animals is actually very easy to forget about as you're living the life of an outlaw. Check out our individual guides links below for a complete walkthrough of everything you need to know about hunting in Red Dead Redemption 2. Red Dead Redemption 2 Hunting Guide. How to Get Perfect Pelts in Red Dead Redemption 2. Red Dead Redemption 2 Legendary Animal Locations Guide. Red Dead Redemption 2 Legendary Fish Locations Guide. Red Dead Redemption 2 Trapper Locations Guide. 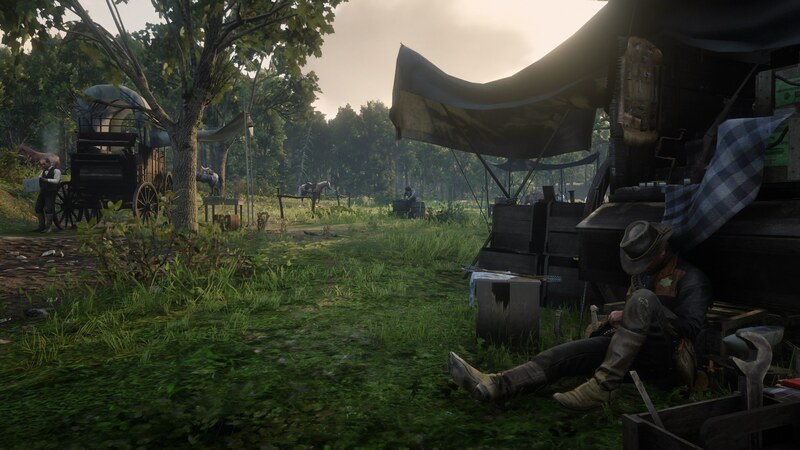 Don't forget about your camp in Red Dead Redemption 2, because it's the life and soul of the gang. Reference the guides below for everything you need to know about the Dutch Van der Linde camp. Red Dead Redemption 2 Camp Guide. Red Dead Redemption 2 Camp Upgrades Guide. To say that there are a ton of collectibles in Red Dead Redemption 2 would be a bit of an understatement. We've listed out all the collectibles you can find in the world just below, including rock carvings, hats, dreamcatchers, and more. Red Dead Redemption 2 Grave Locations Guide. Red Dead Redemption 2 Rock Carving Locations Guide. Red Dead Redemption 2 Dreamcatcher Locations Guide. Red Dead Redemption 2 Hat Locations Guide. Red Dead Redemption 2 Gang Hideout Locations Guide. Red Dead Redemption 2 Shack Locations Guide. Red Dead Redemption 2 Jack Hall Gang Treasure Guide. Red Dead Redemption 2 Poisonous Trail Treasure Guide. It's a deadly world in Red Dead Redemption 2, and there are some fearsome combatants that you can face off against. If you're looking for a complete list of where you can find every Gunslinger around the vast in-game map, click through the link below. Red Dead Redemption 2 Gunslinger Locations Guide. It wouldn't be a Rockstar game without a vast number of cheat codes to bend the game to your will. Check out the guide link below for a complete list of cheat codes that you can put to use in Red Dead Redemtion 2. Red Dead Redemption 2 Cheats Guide. The map of Red Dead Redemption 2 is absolutely huge, and it can take you quite a while to journey around on horseback. You can find our guide to the map of Rockstar's massive game just below, as well as information on how to unlock and use the fast travel system. Red Dead Redemption 2 Map Guide. Red Dead Redemption 2 Fast Travel Guide. There's well over 80 total challenges in Red Dead Redemption 2, and some of them can ask insane things of Arthur Morgan. If you're looking for a complete list of every single challenge in the game, click the link below. Red Dead Redemption 2 Challenges Guide. Red Dead Redemption 2 throws plenty of missions and activities for you to undertake, but not all of them actually count towards your total completion percentage. If you're looking for a comprehensive guide on which missions actually matter, click the link below. Red Dead Redemption 2 100% Checklist Guide. Shooting and fighting are obviously key parts of the wild west. In the links just below, you can find a complete roundup of all our combat-orientated guides for Red Dead Redemption 2. In the list of tips and tricks just below, we’ll be bringing you up to speed on every new detail that Rockstar has added for Red Dead Redemption 2. Even if you played the original game recently, there’s still a lot of new elements that have been added for the prequel. Just above the mini map, you can see three meters. These are your health meter, represented by the heart, the stamina meter represented by the lightning bolt, and the Deadeye meter represented by the eye. The line running around each circle shows how full they are, while the meter in the middle of the circle shows how fast your health, stamina, and Deadeye will recharge. You can use a variety of tonics, herbs, and food items to replenish all three of these meters, all of which can be found in your inventory by holding the left bumper and pressing the right bumper. While you’re on your horse or standing near your horse, you can equip two different main weapons. These include bows, rifles, shotguns, and more, and missions can get a lot tougher if you forget to take a main weapon with you. When you see a white dot on your mini map, this represents a Stranger encounter. These are randomized events, and if you ignore them, there’s no guarantee they’ll be there when you come back later. 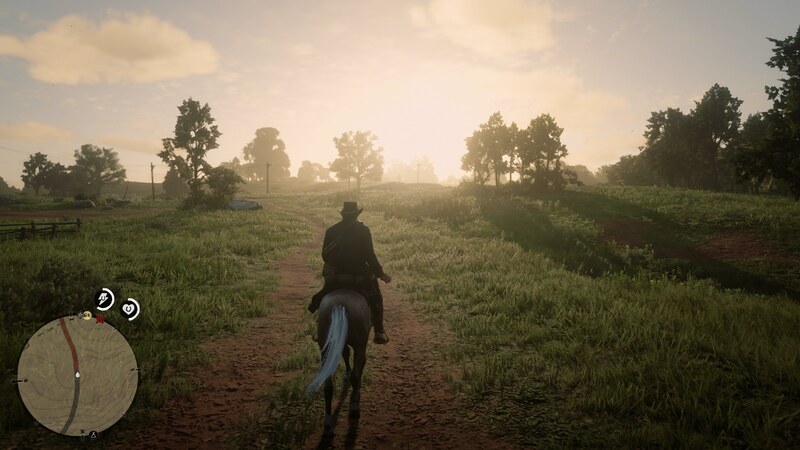 You won't unlock the full map in Red Dead Redemption 2 from the beginning, and you only fill in the blank spots on the map as you travel through them. Remember that you have a bandana in your item wheel, and you can use it while committing crimes to help conceal your identity. Whenever you've got some spare cash, consider donating it to the gang, at the icon on the map with a dollar symbol in a brief case. You can then take this money that you've donated to the gang, and use it to upgrade the camp, giving your companions more medicine, food, ammunition, and better tents. Remember to take care of your horse in Red Dead Redemption 2. By bringing up the item wheel while on your horse, you can tab over to the 'Horse' menu and feed your trusty steed. This is the end of our introductory guide to Red Dead Redemption 2. We'll be constantly adding to this page, as well as our other in depth guides, whenever we uncover any new details in Rockstar's huge prequel.